1. Parliament was unable to achieve a quorum. After a half-hour delay the attempt to hold a session was given up. Parliament will reconvene on 3 January 2012. 2. In a context when Iraqiyya is already boycotting parliament, it was reportedly the absence of the Kurdish parties that prevented a quorum. The Kurds themselves are stressing that “many deputies were absent” and say they are not boycotting in solidarity with Iraqiyya. 3. Several leading Iraqiyya leaders have travelled to the Kurdistan federal region over the past 24 hours. 4. The Iraqi higher judicial council has reportedly issued a prohibition aimed at preventing Vice President Tareq al-Hashemi of Iraqiyya and his security detail from leaving Iraq. Hashemi travelled to Sulaymaniyya in the Kurdish region yesterday. The failure of parliament to hold its scheduled session seems to signify at least a symbolic blow to Maliki’s ambition of doing as he pleases in the wake of the US withdrawal. (Maliki yesteday formally conveyed a request to parliament for sacking his deputy from Iraqiyya, Salih al-Mutlak.) At least for now, the Kurds appear to be putting some kind of break on. 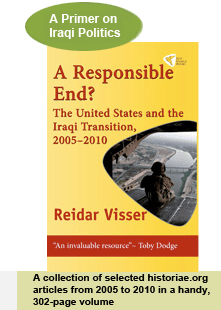 Whether the ultimate aim is to get a better deal from Maliki (as has been their past inclination) or to genuinely work for a more radical restructuring of the Iraqi government remains to be seen.